It may seem like you learned a lot over the past four years, but you probably didn't take a class on how to repay your student loans or what to do with a 401(k). As many of you are about to find out, there's a lot about your personal finances no one taught you in college. It's going to feel awesome earning a paycheck, but less so to start paying rent, utilities, and a credit card bill. Got student debt? You'll have to start paying off most of your loans in six months, and some even sooner. $43,000 a year is the median salary for recent college graduates. But if you majored in something like religion or theology, don't be shocked if you're earning less than your friends who got an engineering degree. With a $43,000 salary, your gross monthly pay will be $3,583. Not bad, right? But that's before taxes. There's going to be a long list of deductions on each pay stub for various taxes like the federal income tax, Social Security and Medicare, plus state and local taxes. So how much will you really make? Your net pay, or the actual amount you'll take home, will be about $2,880 (or less depending on where you live) a month, according to ADP's payroll calculator. If you opt into some benefits -- and you should (more on that later) -- you could take home significantly less than that. Getting a job in a big city like New York or San Francisco is great. But you're going to face some of the highest rents in the country -- and it may be very difficult to keep rent costs to 30% of your budget. How can you keep it down? Hunt for a fee-free apartment without using a realtor so that you can escape a broker's fee (which can cost one month's rent or more) and look for a roommate or two -- which can cut the rent and utility bills in half. But this could be the easiest of all your new adult responsibilities. Under Obamacare, you can remain on a parent's health care plan until your 26th birthday. If that's the case, nothing changes and you can continue to live blissfully unaware of how much health insurance can cost. There is a possibility that your new employer offers better, more affordable coverage than what your parent's plan offers. If you enroll, your employer will probably shoulder some of the cost but the rest will be taken out of your paycheck. Last year, that deduction averaged $94 a month for single workers, or $424 for those with family coverage. If you can't stay on your parent's health insurance and your employer doesn't offer it, you'll have to sign up for Obamacare or risk having to pay a fine. Student loan bills... they're coming. If you can afford to start paying immediately, it's not a bad idea because some loans will already be accruing interest. If you can't afford that, you might qualify for an income-based repayment plan -- which could reduce your payment to as low as $0. Any outstanding debt remaining after 25 years of on-time payments will be forgiven under that kind of plan. And if you're unemployed, you can apply to "defer" payments for up to three years. Refinancing your loans to get a lower rate may be a good option, especially for grads with good credit and a solid income. It could slash you monthly payment and save you money in the long-term. If you apply and find out you're not eligible to refinance now, it's worth trying again later when you're earning more money. 401(k): Yup, that's a thing you should be doing, too. While it might be tempting to throw any and all extra money at your student loans (like I did), an early start on retirement saving is crucial. If you're lucky enough to get a 401(k) at work, that's where you should be stashing your extra money after paying what's required on your student loan bills. That's because the money you put in your 401(k) now will have at least 40 years to grow before you reach retirement. A lot of employers will match what you save in your 401(k), up to a certain amount. You definitely want to contribute enough to take full advantage of the match. How much should you be saving for retirement? Taking into account both you and your employer's contributions, shoot for stashing away 10% of your gross income (before taxes). I didn't do that at first, and I'm kicking myself now. If I had contributed another $142 a month for one year and gotten a company match, that extra savings from me and my employer alone could have grown to $23,992 by the time I'm 67 years old, assuming an average annual rate of return of 5%. What happens if you lose your job? Or want to change your career path and need to take a pay cut? You'll feel better about doing so if you have some money saved to fall back on. Experts suggest saving enough to cover six months of necessary expenses -- like rent, utilities, and food. Put it in a savings account and don't touch it until you need it. Correction: An earlier version of this article incorrectly stated the average monthly deduction for health insurance. It is $94 a month for a single worker and $424 a month for a worker with family coverage. 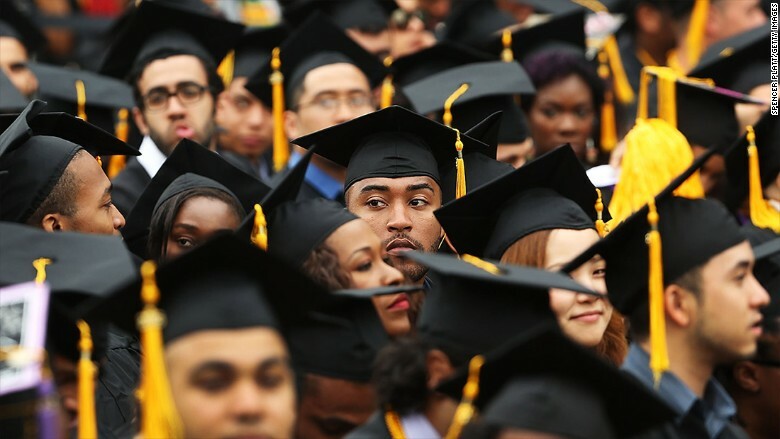 Did you graduate from college this year and land your dream job? We want to hear about it. Share your story with CNNMoney by emailing Katie.Lobosco@turner.com.